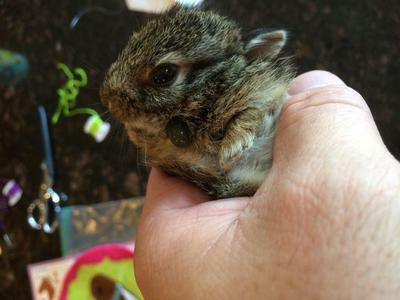 Found a next of wild rabbits late last week...or what was left of them - a neighbor's cat was in our bushes by the nest one morning and late the next day my younger daughter noticed a baby rabbit crawling on the rock next to the bushes. Obviously a newborn as it was very tiny and its eyes were still closed. Being mindful of disturbing it we let it be. The next day it was still in the same spot. I did look around the bushes for more and found one more dead one. There was no obvious trauma and the live one seemed for malnourished and weak. Long story short, over the course of the next day the live one died but we did find 4 more - two already dead (one with trauma like you would see from a cat's claw) and two still alive. The live ones looked healthy though (much 'plumper' then the first one we found) and were under a bush - although it didn't really look like a nest based on the images I found online. I had thought that they were abandoned and scattered from the cat. My daughters being daughters were fascinated with them and were able to touch and hold them. I know that wasn't probably the best course of action, but they are 7 and 11 so it was out of my hands a little bit. They only held them for a little bit and put them back. We did notice an adult bunny come back the next night, which is great as the few animal rescue places we have around here don't take in wild rabbits. However, the next morning, one of the rabbits was away from the nest and dead. Not sure if it was the cat again or something else. The one left (named "Cutie") seems to be doing okay now for the last few days but a different problem has come up: we noticed what looks to be 'growths' on its chest - sort of like small tumors. From doing research it doesn't look like some of the medical issues that wild rabbits can have so I'm sort of at a lost what to do. I managed to grab Cutie and take a picture. Does anyone have any ideas? What do you think, folks? I myself have never seen such a thing. Given the history of trauma, I wonder if it is an injury that will eventually heal? Is it a big blood-blister sort of a thing? That is my first guess due to the dimpling and the dark color. Is there a maggot in there, or another sort of a parasite? Sure wish I could provide more help, David. If your post does not elicit any light on the subject, and if the little critter doesn't die, you might see what a veterinarian says about the nodule. Good luck! Comments for Wild Rabbit Skin Nodule? This type of nodule found on a rabbit is a type of botfly maggot called Cuterebra found exclusively in the US. This is a different type of fly than the ones who cause flystrike. This fly lays it's eggs in the entrance of a rabbit's nest and enters it's body. From there, it travels through the body and settles near the surface of the skin, where it forms the knot you're seeing. This maggot causes severe pain and lethargy. Also, it can cause a secondary bacterial infection and the maggot can migrate to the brain, causing irreversible damage. It must be surgically removed. Hope this helped! Yes, botfly was one of my first thoughts, although the swelling in the picture doesn't exactly match all the pics I've seen of bots (the localized swelling is called a bot or a warble). Can an air hole be seen near the middle of the nodule? This idea should probably be pursued, if the kit is still alive, and if the owner wishes it to stay alive. 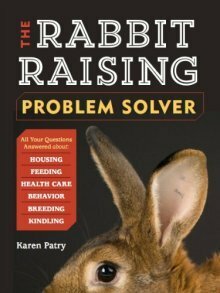 By the way, Karen's Rabbit Raising Problem Solver does cover botfly infestations. I didn't mention it before, but there are actually three nodules, the other two being right beside the one shown in the picture, yet smaller (you can sort of seem them if you zoom in). Between the first day we noticed them and the next when I took the picture they had grown approximately 50-100% in size. I didn't see Cutie tonight though. As I mentioned, I didn't see anything that resembled this in any research I did. It does seem very shiny and 'waxy'. Not so much a blood blister and I can't really see any sort of parasite in it nor other evidence of parasites (from the pictures I have seen from researching). No other injuries as far as I can tell.